Soldering tweezers in 8 of the most popular shapes and sizes. Made from Stainless steel. Tweezers are Anti-magnetic and anti-acid. Soldering tweezers in 5 of the most popular shapes and sizes. Made from Stainless steel. Contains a AA, No 1, and a No 5 Tweezer in a pouch. 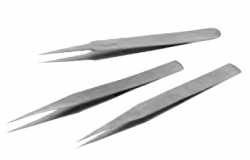 Set of 3 Plastic Tweezers/Tongs for all kinds of Hobby and Craftwork use. 6", 7" and 10"